What if I know an abuser? We just discovered a site that has been around a while. JenniferAnn.org was created because a high school student, Jennifer Ann, was murdered by her ex-boyfriend. They host a video game creating contest every year with a different theme to try to teach about dating violence and healthy relationships. We spent one meeting playing the 2017 games created to teach about consent. "Stuck in a dark place" is a game that is more serious than most games. You can opt out of the more serious dialog, but you will miss reality. Because life doesn't give you an opt out button. This game places you as a perpetrator of ignoring consent, or not fully understanding what it means. But you are also a victim of others who have disregarded your right to consent. It also helps give ways to deal with anger and what to do in different situations. There are also little games within the game. 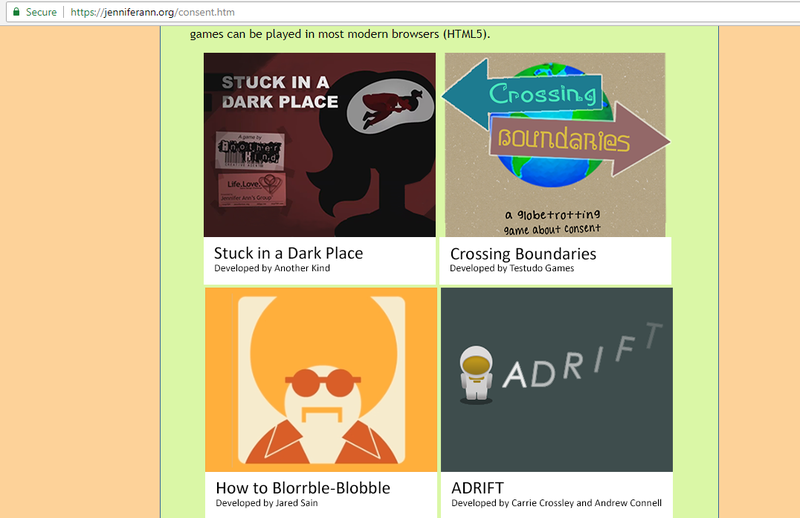 ​"How to Blorrble Blobble" is a more lighthearted game to teach consent. The Blorrble Blobble is a dance and you learn the dance as well as how to ask a partner to dance with you. There are different steps to the dance and before you do each step, you have to ask consent. Sometimes your partner wants to do one step, but not the other and you have to respect that. Other times, your partner might be drinking and they cannot consent if they are drinking. This game is about dancing, but this concept can apply to many situations. "Crossing Boundaries" you travel around the world with some friends and find yourself in different situations and you can be a great bystander or upstander in my opinion. There is a game called 'Snog-a-Frog' where you learn about different ways that people are unable to give consent. "Drift" is in space which we thought was cool, but this wasn't our favorite. You have different tasks to perform and have to follow directions very specifically and ask before you move on. So that does explain consent and that computer is very assertive when speaking, but almost crosses the line in how harsh it can be. ​With popular media that covers the topic of domestic abuse and its victims, especially without romanticizing it, being few and far between, it may seem ironic that one of the most notable examples is a television show that involves mind-control and super-strength. Nonetheless, the Netflix original television show Marvel’s Jessica Jones details the struggle of the titular character (played by Krysten Ritter) in coping with the aftermath of her time under the influence of the series’ antagonist: Kilgrave (played by David Tenant) in a surprisingly realistic way. Disclaimer: Broad narrative elements of the Jessica Jones plot are revealed below. The character Kilgrave is designed to represent an abuser. He has ability to compel others into following his commands, simply by telling them to, which is used as the fictional equivalent of an abuser’s ability to coerce their victims into performing actions that they are not comfortable with. Prior to the events of the series, Kilgrave had taken control of Jessica’s mind and forced her into a variety of heinous actions against her will including murder. Throughout the events of a significant portion of the narrative, Kilgrave attempts to persuade Jessica into returning to him without the use of his powers, but his emotional abuse continues. He minimizes the harm he inflicted on her while advocating a distorted view of the past that portrays himself as well-meaning. He repeats that he truly “loves” her and would treat her differently this time around while simultaneously threatening to harm others if she doesn’t give into his demands. Like many real-life abusers, he strives to keep his victim involved in a relationship through a mixture of false promises and physical threats. On the other hand, Jessica represents a victim learning to move forward with her life and realize that the abuse was not her own fault. At the start of the series, she has already managed to get away from Kilgrave, but she continues to feel guilty because of her actions under his control. This has led her to adopt unhealthy coping methods including alcoholism. As the series progresses, she comes to realize that she cannot hold herself responsible for the actions she carried out without free will, helping her to overcome the influence he held over her. 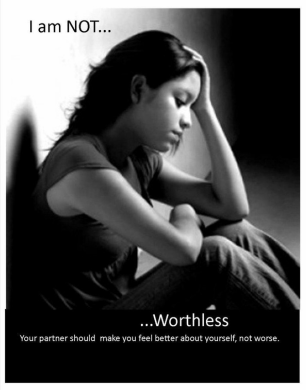 In the real world, many victims blame themselves for abuse inflicted upon them. Yet it remains important to know that the fault lies with the abuser and not the abused. 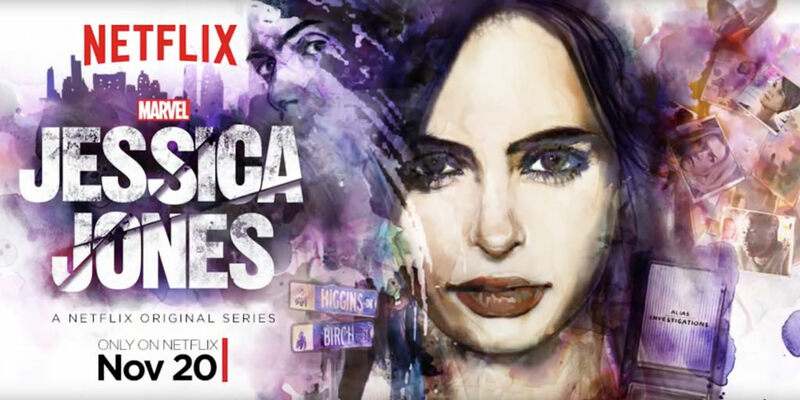 All episodes of Jessica Jones season 1 are available for streaming on Netflix. However, mature content is present, so viewer discretion is advised. Season 2 of Jessica Jones will premiere on March 8th. April was Sexual Assault Awareness month, and even though it’s over we believe it’s always a good time to talk about consent. A couple weeks ago, Scream Queens actor, Abigail Breslin, opened up about being sexually assaulted by an ex-partner. It began when she posted a couple pictures to Instagram and disclosed a few details about the assault, including that she was in a relationship with the person who raped her. We’ve heard these questions one too many times: sexual assault in a relationship? How is that possible? Aren’t you both on the same page if you’re dating? The concept of sexual assault within a relationship may sound totally strange, but the reality is that it can happen. For the record, consent doesn’t change when you enter a relationship; everything about consent remains the same. Dating someone does not automatically give your partner consent, so there is never an obligation to say yes to your partner! Being in a healthy relationship is all about being able to make your own choices, respecting your partner and being respected, and feeling safe. Let’s begin with the fact that consent is ongoing: this means that it can change and be taken back at any point. You may have been on the same page with your partner two minutes ago, but later you changed your mind -that may happen and that’s okay! You always have the right to change your mind and your partner should respect that. Consent is about equal power: if someone is asleep, under the influence, or in a vulnerable position in any way, then they are not at equal power and can’t consent. Consent is about making a choice that you are comfortable with, not being pressured into saying “yes” -and consent can’t be gained through threats or manipulation, either. If we don’t feel free to make that choice for ourselves, consent cannot happen. Consent is expressed through words of affirmation, for example, “yes”. If your partner is silent, or does not respond, that is not consent and that does not give you permission to keep going. Just because you don’t hear the word “No”, doesn’t mean you can keep pushing. The absence of “no” does not mean “yes”. Only yes means yes! April is Sexual Assault Awareness Month and it is so important to talk about consent. We decided to create our own video to help everyone understand the concept. And of course, we had to do it using cupcakes, mmmm. It can be difficult to feel comfortable in your own skin when there are messages that tell you that only certain things are cool or beautiful. We should remember that being unique is a wonderful thing! There are certain things about all individuals that make them one-of-a-kind and that stuff is great! Being able to accept others for who they truly are, standing up for what is right, that’s not always the easiest thing to do, but it is the right thing to do. If you see something that isn’t right, do you try to help or do you tell yourself that it’s none of your business? If you notice that your friend is changing their appearance for their partner’s requests do you tell your friend you are concerned, or do you ignore it? Just read a beautiful blog post titles "33 Fast Facts About Love" and it was full of amazingly surprising details. Most of those 33 facts were based on first loving yourself. There is no other way to feel loved by others if you do not believe you are worthy of that love. It is so important for each of us to realize this notion, and not on an abstract basis, but truly deeply loving yourself and believing that You (yes, you) are a lovable person full of qualities that others will value. If you don't love yourself, please reach out and find help. Take time to get to know all of you, not just those flaws that you focus on. Listen to the compliments, not only the criticisms. Learn a new skill and enjoy it, don't worry about being the best or being perfect at it. Look in the mirror and smile at yourself. 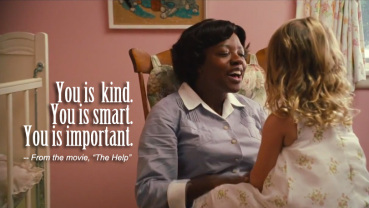 To quote Kathryn Stockett's The Help, "You is kind. You is smart. You is important." We're so sad to hear about yesterday's break-up violence incident at Winter Springs High School . Our thoughts are with the victim for a safe and quick recovery. Teens, it's important to know that violence is never the answer. If you or a friend are in an unhealthy or abusive relationship and are needing help, please do not hesitate to reach out to us or SafeHouse​ (24/7 hotline: 407-330-3933) for additional resources. Help B.R.A.V.E. raise awareness about domestic and dating violence by having open and honest conversations, with family and friends, about what it means to have a healthy relationship and a healthy break-up, free from violence and abuse. Together, we can make a difference! Click Here if you're interested in reading more about the incident. It's Summer! Check out B.R.A.V.E. 's Top 10! Some describe summer time as being lazy and catching up on some much needed rest and relaxation, am I right?! It's a time to hang out and have some fun in the sun with family and friends! Or maybe your summer isn't as easy going since you're taking summer school classes or working hard to save some money for your first car or even college! Soooooo check out some of our recommendations below! B.R.A.V.E. 's TOP 10 BOOKS TO READ THIS SUMMER! Leave a review of the book you read in the comments below or let us know if we missed a book that should be on this list! We'd LOVE to hear what you think! Wishing everyone a safe and happy summer! Huge thank you to our friends at UCF Victim Services for passing along the videos below! It's important to know the signs of abuse and how to reach out for help. Let's us know how you would help a friend in the comments below! What does a friend really need to hear? You may feel tongue tied when you see a friend hurting and you don't want to make it worse, but honestly, staying silent makes it worse. What they really need to hear is that you care. That they don't deserve what is happening. That they are kind and smart and important. Don't make them feel bad for being involved with someone who hurt them, they already feel that shame. They may love that person even if you don't understand it. Just point out the behavior that their partner does that is not good and tell your friend no matter what , they don't deserve to be treated that way. Build them up, they need to feel your love, not your judgement.